Designed to reduce the incidence of flushing and itching commonly associated with niacin use. 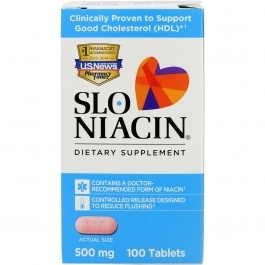 Adults: One Slo-Niacin Tablet morning or evening, or as directed by a physician. Before using more than 500 mg daily, consult a physician. Slo-Niacin Tablets may be broken on the score line, but should not be crushed or chewed. The inactive matrix of the tablet is not absorbed and may be excreted intact in the stool. Caution: Niacin may cause temporary flushing, itching and tingling, feelings of warmth and headache, particularly when beginning, increasing amount or changing brand of niacin. These effects seldom require discontinuing niacin use. Skin rash, upset stomach, and low blood pressure when standing are less common symptoms; if they persist, contact a physician. Slo-Niacin Tablets should not be used by persons with a known sensitivity or allergy to niacin. Persons with heart disease, particularly those who have recurrent chest pains (angina) or who recently suffered a heart attack, should take niacin only under the supervision of a physician. Persons taking high blood pressure or cholesterol lowering drugs should contact a physician before taking niacin because of possible interactions. Do not take niacin unless recommended by and taken under the supervision of a physician if you have any of the following conditions: gallbladder disease, gout, arterial bleeding, glaucoma, diabetes, impaired liver function, peptic ulcer, pregnancy or lactating women. Increased uric acid and glucose levels and abdominal liver function tests have been reported in persons taking daily doses of 500 mg or more of niacin. Discontinue use and consult a physician immediately if any of the following symptoms occur: persistent flu-like symptoms (nausea, vomiting, a general "not well" feeling), loss of appetite, decrease in urine output associated with dark-colored urine, muscle discomfort such as tender, swollen muscles or muscle weakness, irregular heartbeat, or cloudy or blurry vision. Keep out of the reach of children.